A MUST-HAVE FOR EVERY AUSSIE SCHOOL! With an estimated life span of 10 years, you'll run this course dozens of times. At its full price of $295 plus GST for the course materials and $49.95 plus GST for the DVD, MAKING FANTASTIC SHORT FILMS is a quality teaching aid at a tremendous bargain. NOW just $179 plus GST for both! 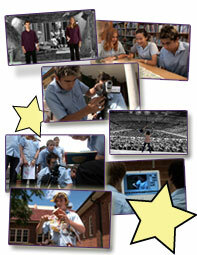 MAKING FANTASTIC SHORT FILMS meets curriculum requirements for ENGLISH, DRAMA, and MEDIA STUDIES departments. It also serves as a powerful teaching tool for ANY subject, including History, Science, Languages, Arts, Physics, Social Studies, etc. ONLINE: The quickest and easiest way to order is through the online store, via credit card. Your order ships the next business day via Express Post. You pay the current SALE PRICE plus shipping cost. CHEQUE OR MONEY ORDER: Simply post a cheque or money order payable to "Embryo Films" to Embryo Films, PO Box 3325, Redfern NSW 2016 along with the PDF order form. You pay the current SALE PRICE plus shipping cost. Click here for the Australian order form. DIRECT DEPOSIT: Determine the total cost of your order (SALE PRICE plus shipping cost), and deposit the funds into our account from any Australian bank. Our account details are St George Bank, BSB 112-879, account name Embryo Films, account number 039730545. IMPORTANT NOTE FOR DIRECT DEPOSIT ORDERS: Please ensure that the reference number we will see on our system is YOUR EMAIL ADDRESS. Then, send an email from that email address to mfsf@embryo-films.com with a transaction reference number, and your full order details, including price, school name, your name, shipping address, billing address (if different), and phone numbers. If we can't get in contact with you, we can't ship it to you, so please ensure that you provide all details correctly. We will verify your payment by the next business day, so if you don't hear from us within 48 hours, contact us and we'll get it sorted out. PURCHASE ORDERS: If your school can only buy with a PURCHASE ORDER, we require that you pay the FULL PRICE amount. Purchase orders will not be accepted at any sales price amount. An invoice will be sent with the product itself, and must be paid within 30 days. Send your official purchase order AND our printed order form via FAX to (02) 8915 1533 or via EMAIL to mfsf@embryo-films.com. Click here for the printed order form. PRE-PURCHASE INVOICE: If your school needs us to send an invoice before you can issue a cheque for the order, please email the order form (or just its details) to mfsf@embryo-films.com with the subject "MFSF INVOICE REQUIRED". We will endeavour to email you an invoice within 5 business days. And if you have any questions about ordering, don't hesitate to contact us on (02) 8011 3533. Don't delay. Order your copy today!